1739 Elsewhere events were leading up to the War of Jenkins' Ear. It seems that the ear of a British master mariner, Robert Jenkins, was cut off after his ship was pillaged by a Spanish man-of-war in the West Indies. At the time the incident attracted little attention, but the matter was raised in a House of Commons committee and Britain declared what was essentially a convenient maritime war on Spain. As with all other wars between Britain and Spain, there were immediate repercussions for Gibraltar. 1740 It was during this decade that several of my known great, great, great, great, great, grandfathers were born. Their surnames were Arengo (7.3), Cerisola (7.5), and Anselmi (7.7). The Arengo family were definitely still in Genoa at the time but I am not sure about the other two. The surname Arengo, no longer exists in Gibraltar. Nor is it probable that it was ever very common. 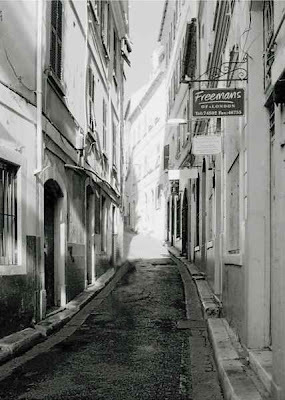 However, it is known that at least one Arengo family, originally from Genoa, arrived in Gibraltar in 1756 and that the name of a rich merchant called John Arengo is commemorated in two minor streets on the rock, 'Arengo's Palace', and 'Palace Gully'. 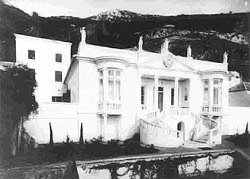 The 'Palace' refers to a sumptuous house near the Sacred Heart School that has since been demolished to make way for a car park. 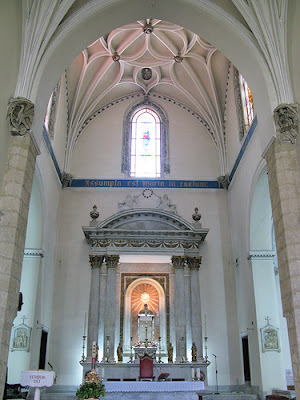 Later, during the early 19th century,the head of the family at the time arranged for an altar to be built inside the Cathedral of St. Mary the Crowned. Fluted marble columns with Corinthian capitals were used to support a six ton ‘bogatttino’ or half circular pediment. These marble structures were originally intended for an unknown South American church. The ship that carried them sank in the harbour and the Arengo family bought the salvage rights. Many years later the marble columns and the pediment were transferred to the main altar. However, what very few people know is that the various marble blocks and columns are covered in Masonic symbols which – not surprisingly given the Catholic Church’s hearty dislike of all things Masonic - have been carefully covered up or disguised. John Arengo eventually became Master of the first Masonic Lodge in Gibraltar which was specifically created to allow local membership – The Lodge of Friendship No. 577. 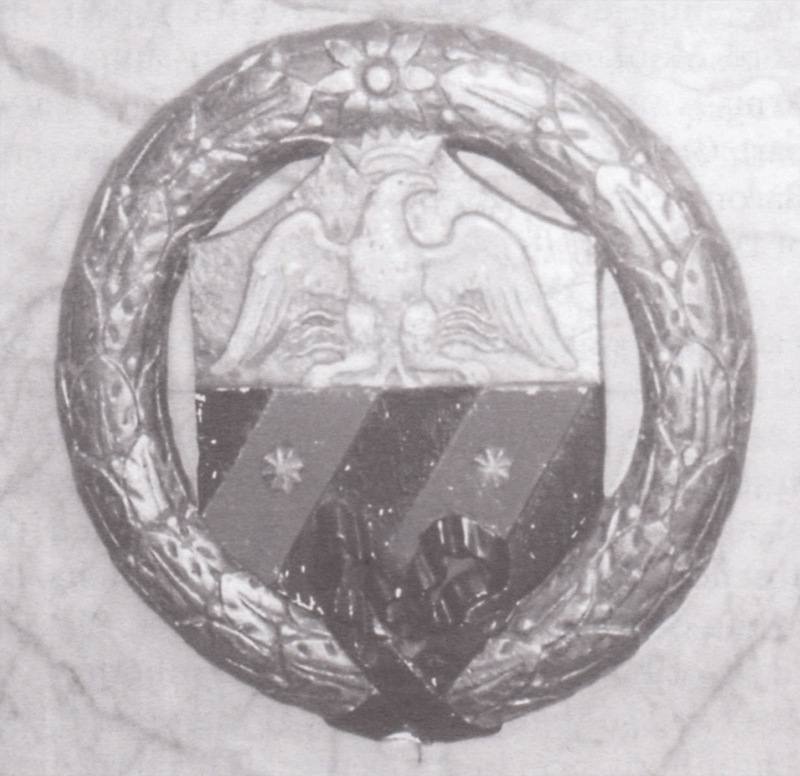 In the end, such was the families wealth and influence that they acquired their own coat of arms and these were incorporated as part of the altar. When he died, John Arengo was buried within the Cathedral itself – an expensive privilege only available to the very rich. His memorial describes him as ‘a noble Genoese who maintained the honour and glory of Genoa.’ Despite having lived on the Rock for over half a century, he felt more for the land of his birth than for the place where he had made all his money. Angelo Cepolino (7.1) was also born around this period probably in the Genoese town of Sanpierdearena and there is enough circumstantial evidence to confirm him as one of my great, great, great, great, great grandfathers. His surname, which first appears on a 1777 register of inhabitants of Gibraltar, seems to be a corruption of 'Cipolina'. It is also intriguing to note that Angelo's (7.1) first name in its Spanish version of 'Angel' reappears no less than eight times in subsequent generations of the Chipulina family. Whatever the merits of the above arguments what is absolutely certain is that his name appears again on a later official register of people of Genoese decent living in Gibraltar. Why he came to the Rock is open to conjecture. He was either escaping the upheaval in Italy or drawn by the possibilities of Gibraltar's booming economy. Presumably Angelo (7.1) was just one of the many. He may have plied some humble trade or other and lived in relative poverty, although there is some circumstantial evidence that suggests that he and his family were not that badly off. 1740/48 A year later the War of Jenkins' Ear merged almost imperceptibly with the War of the Austrian Succession. Meanwhile Major-General William Hargreaves became Governor of Gibraltar. In Britain the Jacobite Rebellion ended at Culloden Moor near Inverness, while Genoa, the home of many of the Chipulina family ancestors, was heavily bombarded by the French. 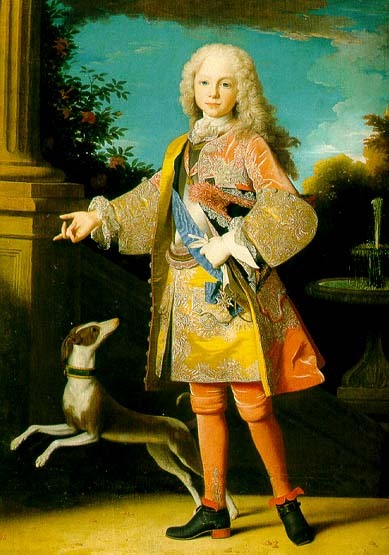 In Spain Philip V died in 1746 and was succeeded by Ferdinand VI. The war finally came to an end with the Treaty of Aix-la-Chapelle and commerce between Spain and Gibraltar reopened. Robert Poole, an English medical writer, visited Gibraltar for several weeks in the winter of 1748. He wrote a detailed account of what life was like in Gibraltar at the time. The following are some extracts from his diary. Water wheel known locally as a ‘noria' commonly in use on the Rock at the time. 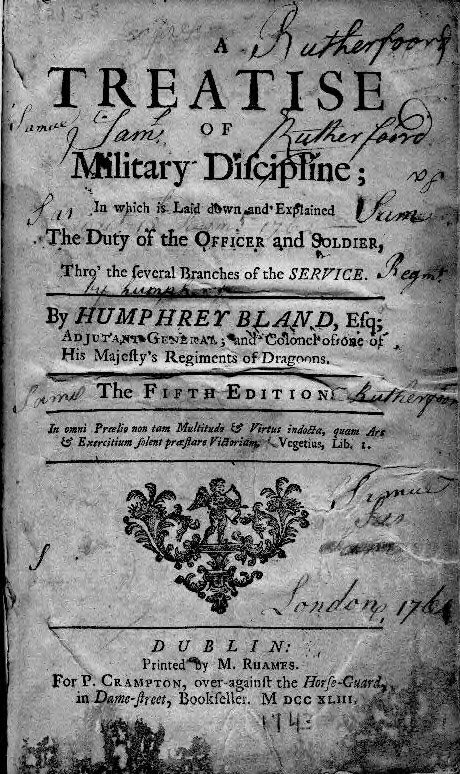 1749 General Sir Humphrey Bland was made Governor of Gibraltar. He was an excellent administrator and for many years and under several subsequent Governors, Gibraltar was run largely in accordance with regulations drawn up by himself during his tenure in office. 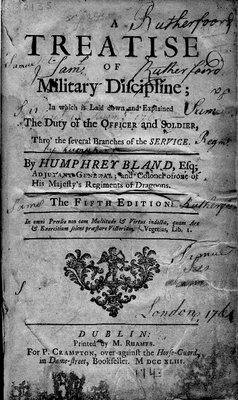 He also wrote an important treatise on Military Discipline for the Army. It was during his term at the helm that a peculiar corps of local volunteers was formed to serve as frontier sentries. The reason for the formation of the corps was that the regular soldiers were disgruntled with their conditions of service and tended to desert. The locals, on the other hand, having their families on the Rock had little motive to do so. After a while they came to be known as the 'Genoese Guard' and were eventually transformed into what were essentially civil policemen. They were in fact the forerunners of the Gibraltar Police Force. In Gibraltar Major-General Thomas Fowke became Governor. The civilian population was now 1816 of which nearly 600 were Genoese. These were mainly fishermen, sailors, gardeners, labourers and menials. According to Garrison orders, Colonial Office and other papers, Gibraltar was a sad place to live in at the time. The garrison hated every minute and took solace in women, drink and brutalizing each other. Traditional 'minor' punishments included 'running the gantlope' in which the victim was whipped while running between two rows of fellow soldiers, and 'riding the wooden horse', where the victim sat astride a wooden triangle with sixty pound shot tied to his feet. Flogging was a common occurrence. This was also a period of unusual occurrences on the Rock. First there was a swarm of locusts, then a plague of butterflies, and finally one evening a ball of fire shot across the sky from west to east and exploded over the Mediterranean. It was witnessed by a large portion of the garrison and the civilian population. It was probably a meteorite. 1754/6 Meanwhile in Europe the events leading to the Seven Years' War were well under way. Some historians have suggested that this war laid the foundations of the British Empire. Gibraltar, as always, was involved both directly and indirectly. In one of the many skirmishes, the French attacked Minorca. 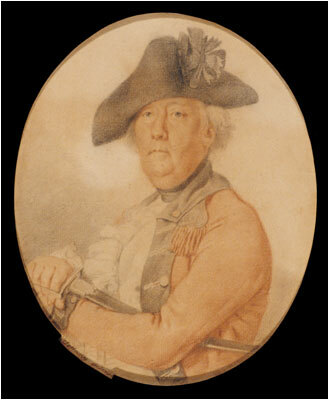 General Fowke, Governor of Gibraltar, refused to part with soldiers to defend the place although ordered to do so and the French took the island. 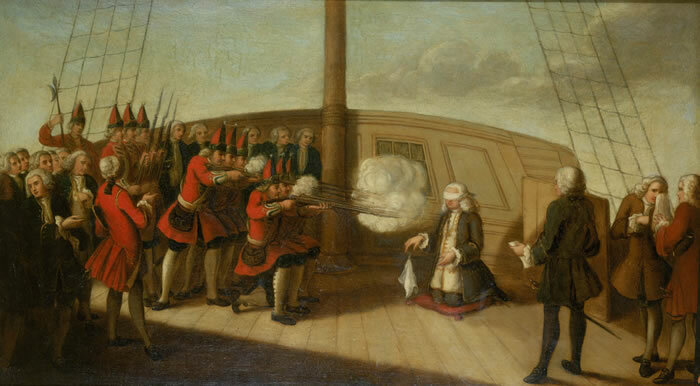 Admiral Byng then engaged the French fleet, failed to defeat them, and returned to Gibraltar leaving Minorca to its fate. He was executed for his failure, ‘pour encourager les autres’. Gibraltar was then blessed with a Governor who was both keen on defence and ready to spend enormous sums of other people's money on fortifications and other more exotic constructions. The second Baron Tyrawley, Lieutenant-general James O'Hara had arrived. Despite the grandiose building schemes during his term in office the civilian population remained almost static at 1 810 of which 597 were Genoese. 1757 In August, during the Seven Years War, an offer was made by William Pitt to cede Gibraltar if Spain would break with France. Spain rejected the offer. The eighth Earl of Home, Major-General William Home became Governor and much to the disgust of the locals allowed Spanish customs to set up an office in the mole to search ships for contraband. 1758/59 The heir to the Sultan of Morocco who would eventually become Mohammed XVII, declared war on Gibraltar because of some local dispute. It was an event of historical curiosity as it was the only time that any country had ever declared war on the Rock itself. That year Ferdinand VI of Spain died and was succeeded by his half-brother, Charles III. It was all change in Britain as well. George II died and his son George III was crowned king of England. 1760 My great, great, great, great, grandfather José Chipolina (6.1) was born in Sanpiedarena in the Republic of Genoa around this period and qualifies as the oldest confirmed ancestor of any branch of the family. It is impossible to say with certainty whether he was Angelo Cepolino's (7.1) son, but the relevant dates suggest that he could have been. In fact I think he must have come to Gibraltar at the same time as his father. Two more of my great, great great, great, grandparents were also born during this period. They were Antonio Cerisola (6.3) and Maria Anselmi (6.4) both probably from somewhere in Genoa. In Gibraltar a conspiracy was formed by disaffected soldiers. They intended to surprise, plunder and massacre their officers. An accidental quarrel in a wine house led to its downfall. Some 730 people were implicated and the ringleader, a private called Read, was executed in the Grand Parade. Elsewhere on the Rock work began on the Naval Dockyard. It would be used mainly for refitting and supplying vessels of the Royal Navy. 1761 The following year the engineer William Green arrived in Gibraltar. He had been instructed to review the defences of the Rock. Soon after Lieutenant-General the Hon. Edward Cornwallis became Governor of Gibraltar. One of his colleagues described him as follows: “If we may judge from the course twice taken by him when under difficulties, he was lacking in the firmness required to oppose the authority of his superiors” Not knowing what to do with him they made him Governor of Gibraltar. 1762 Magdalena Arengo (6.2), who would eventually marry José Chipolina (6.1) , was born somewhere in Genoa. It was also probably around this time that two other members of the family Francesco Sacarello (5.9) and Maria Russo (5.10), were born in Spotorno in the Republic of Genoa. 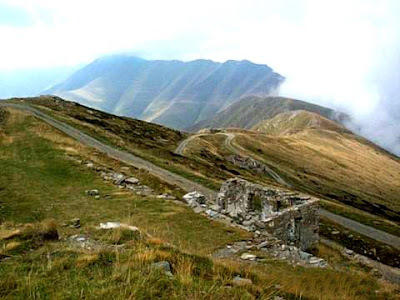 Little or nothing is known about them other than that there is a mountain near Genoa called Sacarello which is part of the Maritime Alps, is over 2200 meters in height and dominates the local landscape. It suggests that the Sacarello side of the family originally came from some village in the area. It is also reasonable to suppose that Guiseppe Bignone and Paula Salari from the other side of the family were also born around this time. About the only thing known about these very nebulous characters is that Guiseppe was born in the Republic of Genoa, and that Paula came from the City of Genoa itself. 1766 Meanwhile Gibraltar was continuing to prosper. According to Ignacio Lopez de Ayala, author of the first history of Gibraltar, almost all the maritime powers maintained consulates at Gibraltar. He was also amazed that, 'so many people can be maintained by trade in so small a space . . . there being neither manufactures nor agriculture tended to.' It was an acute observation of a situation that has always been endemic to Gibraltar. In January a tremendous storm struck Gibraltar. Hailstones fell the size of walnuts and torrential rain came down the mountain side taking all before it. Many people were either drowned or killed. 1767/70 The civilian population was 2 710 but details of the register giving the names of the individual families are not available. Nevertheless it seems that it was already difficult to distinguish between people of Genoese and Spanish origin as they had frequently intermarried. After a visit to London to put forward his plans, William Green returned to Gibraltar and began to overhaul every inch of its fortifications. Rather than employ labourers he was allowed to form a Soldier Artificer Company of skilled men under military discipline which was ultimately to become the corps of the Royal Engineers. His most impressive innovation was the construction of King's Bastion, a spectacular achievement by any standard. When it was finally completed six years later it boasted bomb proof casemates for 800 men and could be self-sufficient under attack for as long as supplies lasted. 1771/4 Crutchett's Ramp, a short steep road in Gibraltar where eventually many generations of the family would live, was already in existence at the time. Crutchett's Ramp. The three storied house in the sunlight at the far end of the Ramp was built by my great grand father Diego Gomez (3.7) . It still belongs to the family. 1775 In Madrid, Ignacio Lopez de Ayala, put on a play called La Numancia Destruida. Its message was that Spaniards should not flinch from the cost of driving an invader from its shores. It was a not too subtle reference to Gibraltar. That year the protagonists of the 'Boston Tea Party' extended their celebrations and the American War of Independence began. The Great Siege of Gibraltar took place during the period of this war, depriving Britain of upward of 6 000 of her best troops which were desperately needed in the war against her American colonies. Once again the Rock showed its peculiar capacity to influence world events, albeit indirectly. 1776 By now Gibraltar had become an important exchange mart. Danish, Dutch, and North American ships unloaded tobacco, sugar, cotton, mahogany, dried cod, rum, rice, and maize, and loaded manufactured goods brought there from Britain, France and Holland. There was also a clandestine trade in wines, oranges, lemons and dried fruits from Seville, all of which provided more work for the Genoese. Gibraltar's attraction was twofold. Its economic development was now unequalled elsewhere, and the British administration imposed the sort of order not found in similar ports. That year Adam Smith published his Wealth of Nations. In it he suggested that the acquisition of Gibraltar and Minorca, had never served any real purpose to England other than to alienate her from her natural ally, the King of Spain. At home, Lieutenant-General George Augustus Elliot arrived as Governor. He was. apparently, an austere ascetic, a teetotaler and a vegetarian. He never slept more than four hours a day and was an early riser who took his health seriously. He had studied both in France and at the University of Leyden. He had served in the Prussian Army and spoke fluent German and French. He was a man admired by friend and foe alike. From the army's point of view, however, he was an 'eager beaver,' and an absolute nuisance. According to Ayala, however, he was 'un soldado de gran teson y conducta.' What is ceratin is that he took his job seriously from the very beginning. The history of Gibraltar is one of unrelenting defeats for the Spaniards and magnificent triumphs for the English. Here is a rare occasion in which things did not quite go to plan. Rear-Admiral Robert Man was sent by Jervis to Gibraltar for supplies. He arrived safely but was chased by the Spanish fleet. As the British fleet was outnumbered he thought it would be best to take his squadron back to England. The immediate result was that the British were forced to leave the Mediterranean. As Man had no authority to make such a decision he was ordered to strike his flag and was never employed at sea again. 2. 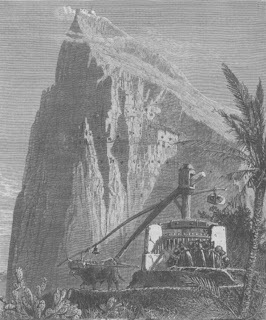 To build an artificial mountain at least as high as Gibraltar itself. 3. To use poison gas. 4. To use balloons in an airborne attack. 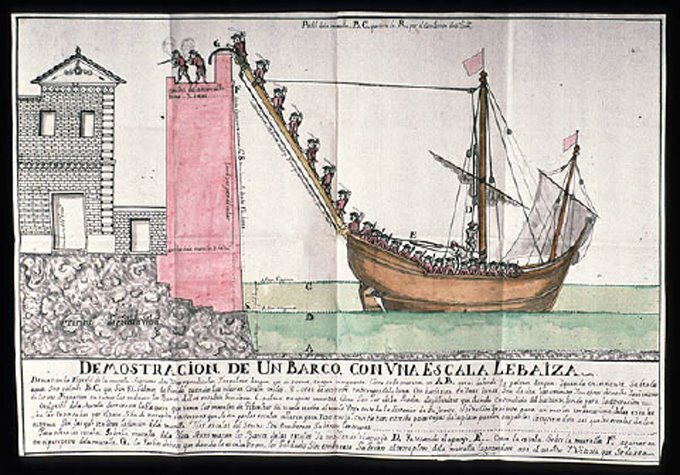 The most practical suggestion was from a gentleman by the name of Silvestre Abarca who suggested the use of landing craft from the south side. One of the many scatterbrained plans submitted is shown below. I am not exactly sure as to how this one was supposed to work. 1778 Understandably the British in Gibraltar became somewhat nervous. An outsize supply convoy arrived in Gibraltar and every inhabitant was instructed to lay in provisions for six months. The local inhabitants, however, were less impressed by the seriousness of the situation and sold most of the extra provisions in Spain. They were soon to regret their short sightedness as the 14th Siege of Gibraltar was just round the corner. Their optimism was nevertheless understandable. Trade was gradually beginning to expand with ever widening sources of imports. There were cattle, sheep, fowl, barley and straw from Tangier, wood, oil and oranges from Tetuan, liquors, wine, brandy, macaroni, chestnuts, lemons, candles, soap and salt from Livorno, muslins and stuffs from Genoa, sugar and biscuits from Cadiz, and charcoal and ducks from Estepona. It was difficult to believe that all this was soon to come to an end.